Our first workshop was in February 2015. Sarah and I were able to fundraise enough money to host a free 6 week workshop at the Pinecrest-Queensway Community Health Centre with donations from the community, both in kind and from individuals. It was a lot of work and many, many hours of volunteered time. Our original goal was a 12 week workshop, but we were only able to fund 6 weeks. It was a really great opportunity though and we’re happy to say that we still communicate and have even become friends with some of the youth we met at this workshop. How were we able to complete the goal of our first free art workshop? We applied for two grants in 2014 (once in the Spring and once in the Fall) with the Ontario Arts Council, but unfortunately we weren’t granted any funds. We then held a fundraising event in July 2015 (A pop-up shop at Three Wild Women) and fundraised over $1100, with the help of local artists. and our art auction. Check out the video we created to present our idea at Soup Ottawa. We played this video in the background while Sarah and I recited everything from our script we wrote out. To thank Soup Ottawa, we created 8 money sacs that future winners could walk away with from repurposed cloths and a promotional video you can watch here. We also had the help of numerous contributions from individuals, like Good Things Ottawa and the The Mix CKCU. Thank you so much to everyone who contributed! We couldn’t do this without your help. Take a look at some of the highlights from February below. A few people who came had never learned art or painted before which was exciting to see their first attempt. Students learned basics of color theory, themes, styles of paintings and types of paint mediums and looked at examples of other work before they adventured on their own. Some painted from reference, others painted from their mind. Our goal was to keep it fun with general guidance and it turned out well! Youth explored using mixed media art and came up with some really funky work. You can see some of their emotions in their art. We had a Guest Speaker: bcayford come in to present and share some insight on being an artist in the industry of animation. (Our 2 guest speakers did receive a small honorarium for their time). Youth learned different styles of photography as well as group collaboration. They acted out scenarios and each person took turns “directing” their shoot. Youth also got to be a part of a music video project that promotes ending violence against women. The song is “Fault Lines” from Scary Bear Soundtrack. You can visit the project HERE. Youth learned how to create stamps using recycled material: insulation and corks. Our initial goal was to use linoleum, but we didn’t have enough funds to purchase the supplies so we received a bunch of insulation to use instead. A guest speaker and professional artist, Mique Michelle, an advocate of graffiti, came in and shared techniques and stories about the misconception of graffiti. We used a chalk “Kid Graffiti” spray as well as a new water-based, non-odourless spray paint (Montana brand). Youth learned how to create their own designs and art work that could be used on t-shirts or on a canvas like a blank hat. Some brought in their own materials. We used screen printing paint, fabric paint and regular acrylic paint. Youth received a large gallery canvas to do a collaborative group project on. Youth hung up their art work and invited guests to come see what they created. We had a new student join us on the last day and everyone got to enjoy free pizza. It’s the end, but only the beginning! We just wanted to thank everyone who helped to make this program happen. To the staff at Pinecrest-Queensway Community Health Centre: to the custodians who helped prepare the rooms, troubleshoot and clean up, to the director of corporate services who facilitated the use of the space, to the HR and administration manager who organized the schedule and contract, to the guest speakers we had come in to share their insight and knowledge to the youth and to everyone who donated time, support and love. To my babysitter (Mailyne speaking) who watched my son so I could volunteer to teach this program. We learned a great deal for the next one and met some wonderful new friends. 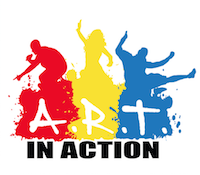 We look forward to bringing out another A.R.T in Action (stay tuned!) and hope that more people can come out and enjoy art for free. Thank you to all the youth for coming out and making our Saturday’s memorable.